It's the deadliest transportation accident in the U.S. in nearly a decade. Two newlyweds and a young upstate New York couple were among the victims of a deadly limousine crash over the weekend, according to their families. Newlyweds Erin Vertucci, 34, and Shane McGowan, 30, were among the 20 people killed near Albany on Saturday, their family said, in what officials said is the country's deadliest transportation accident in nearly a decade. Federal transportation officials are working to determine what caused the crash, the worst in the U.S. since 2009, said Robert Sumwalt, chairman of the National Transportation Safety Board. "Today is really our first full day of boots on the ground [investigations]," Sumwalt said on "Good Morning America" Monday. "We're looking at the human, the machine and the environment" type of factors. The newlyweds and their friends were heading to a birthday party with another couple and several other friends when their stretch limousine skipped a stop sign and slammed into an unoccupied SUV in Schoharie -- about 43 miles west of Albany, authorities said. Investigators have not released details about the victims, but officials said all of the limo’s 18 occupants were killed, as well as two pedestrians who were standing nearby, authorities said. Chris Fiore, first deputy superintendent of the New York State Police, said the limousine failed to stop at the intersection. The speed limit on that road is 50 mph, but it was not immediately clear how fast the Ford limo was going, he said. 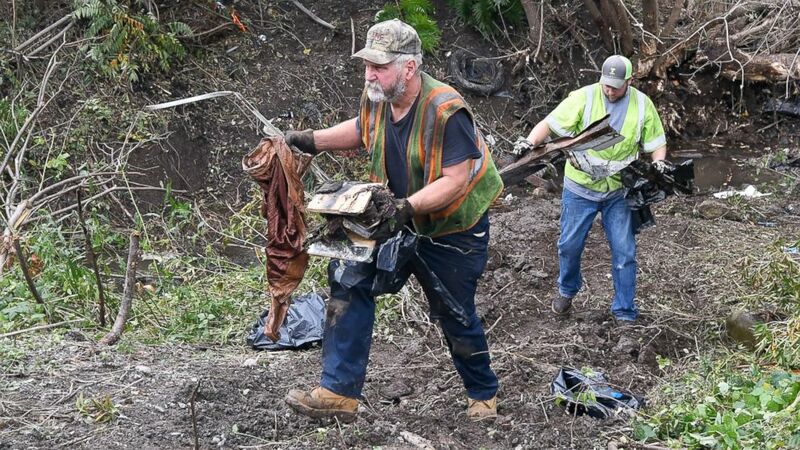 (AP) Recovery crews remove debris from the scene of a fatal crash, Sunday, Oct. 7, 2018, where a limousine crashed into a parked and unoccupied SUV killing 20 people at an intersection a day earlier, in Schoharie, N.Y.
Karina Halse, whose sister Amanda Halse was on board and died in the crash, told "Good Morning America" that officials told her that the limousine "was going down the hill at over 60 miles an hour." 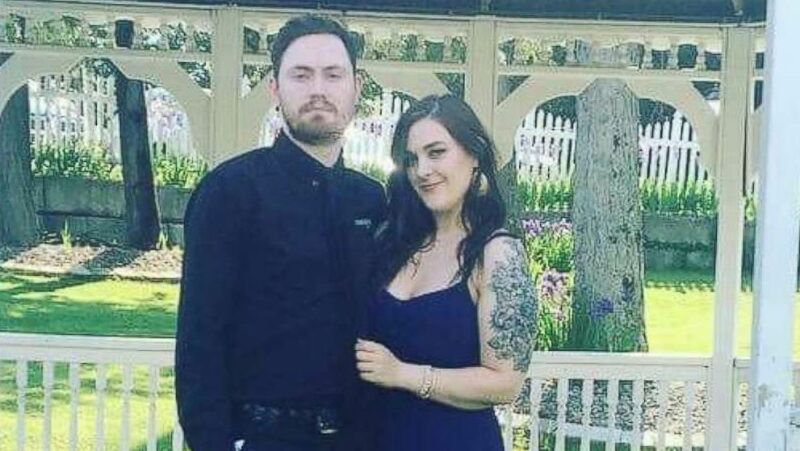 Amanda Halse, 26, and her boyfriend, Patrick Cushing, 31, who had been dating for about a year, were traveling with Cushing’s friends to a party at Ommegang Brewery in Cooperstown, about an hour west of Schoharie, when the crash happened, Karina Halse told “GMA”. (Karina Halse) Amanda Halse and Patrick Cushing were among the victims of a limousine crash that killed 20 people in Schoharie, N.Y., on Saturday, Oct. 6, 2018. Karina Halse said her sister sent her a text message just an hour before the crash occurred, telling her about the limo, but that she wasn’t able to respond in time. Authorities notified Karina Halse of her sister’s death about a day after the crash happened, leaving her family in a state of shock, she said. “She was such a charismatic person and she just wanted to make sure everyone was happy and I'm so grateful that she was my sister out of everyone else on this earth,” Karina Halse said on "GMA." The company which operated the vehicle, Prestige Limousine, has had vehicles inspected five times in the past five years and had four vehicles taken out of service, according to Department of Transportation records. The company had not had any crashes over the last two years, records show. Stretch limos, which are chopped up by second-stage manufacturers and extended in length, are not subject to any regulatory agency. U.S. Sen. Chuck Schumer of New York has pushed for stronger safety measures for limos in the past and said he was "heartbroken" by the tragedy. Authorities have not confirmed victims’ identities, but Barbara Douglas said her nieces were among the passengers killed. "I had four nieces. They are all dead. They were in there," Douglas told ABC News, without identifying them. New York Gov. Andrew Cuomo has sent his condolences to all the families of the victims in a statement on Sunday. "I join all New Yorkers in mourning these deaths and share in the unspeakable sorrow experienced by their families and loved ones during this extremely difficult time," the governor said. "State police are working with federal and local authorities to investigate the crash, and I have directed State agencies to provide every resource necessary to aid in this investigation and determine what led to this tragedy." Investigators had not released any information about limousine or its driver as of early Monday morning. A vigil will be held Monday night for the victims, many of whom were from Amsterdam, New York, at the Mohawk Valley Gateway Overlook, New York State Assemblyman Angelo Santabarbara said. ABC News' Wil Cruz, David Kerley, Whitney Lloyd and Suzanne Yeo contributed to this report.